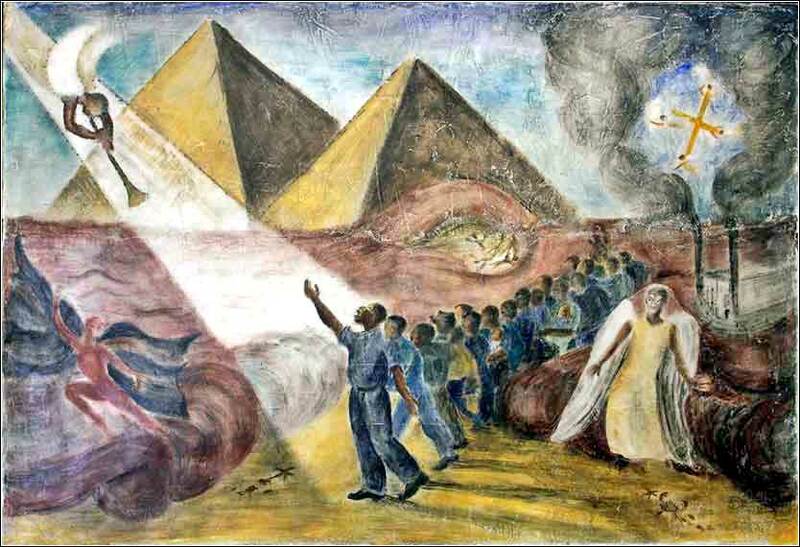 And the Pharoh's Army Got Drownded by Ruth Starr Rose, fresco, 1943. Our "Oldie Goldie" this week is an emotionally powerful rendition of Go Down Moses by Doris Akers, backed by her Sky Pilot Choir. So Moses and Aaron went in to Pharaoh and said to him, “Thus says the Lord, the God of the Hebrews, ‘How long will you refuse to humble yourself before me? Let my people go, that they may serve me. For if you refuse to let my people go, behold, tomorrow I will bring locusts into your country, and they shall cover the face of the land, so that no one can see the land. And they shall eat what is left to you after the hail, and they shall eat every tree of yours that grows in the field, and they shall fill your houses and the houses of all your servants and of all the Egyptians, as neither your fathers nor your grandfathers have seen, from the day they came on earth to this day.’” Then he turned and went out from Pharaoh. Then Pharaoh's servants said to him, “How long shall this man be a snare to us? Let the men go, that they may serve the Lord their God. Do you not yet understand that Egypt is ruined?” So Moses and Aaron were brought back to Pharaoh. But he said to them, “The Lord be with you, if ever I let you and your little ones go! Look, you have some evil purpose in mind. No! Go, the men among you, and serve the Lord, for that is what you are asking.” And they were driven out from Pharaoh's presence. God announces an underlying purpose of the plagues, for the first time. He wants Moses' son and grandson to witness His works. The ESV translates the verse "how I have dealt harshly with the Egyptians", but it could as easily read "how I have humiliated" or "made a spectacle of . . . ." The plagues are a demonstration of His power and wrath, to be remembered for all time. They are also a sign of His commitment to the Hebrews. One might puzzle over the plagues until this point. God certainly has no qualms about destroying cities or nations that have sunk into total idolatry and pridefulness, but in the case of Egypt, He seems wantonly cruel. If all He wants is to free the Hebrews, He could certainly accomplish the task with less fuss and less suffering. Not that we can expect to understand God's methods, always. We are often in the position of savages who see a surgeon's knife cutting open a patient's abdomen, able to see the terrible wound inflicted but unable to grasp that, by this apparently murderous action, the surgeon will save the patient's life. But in this case, we are given a hint to understand the entire plague scenario. Another oddity is the repeated statement that God hardened Pharaoh's heart. We rarely see the Lord taking away free will. 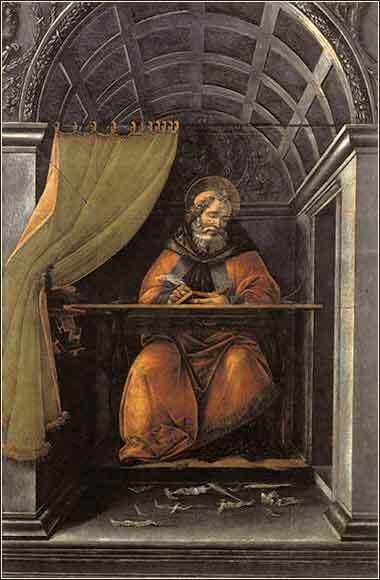 But in Exodus, Moses tells us that Pharaoh's intransigence was God's work. In the context of the entire Bible, we must believe that Pharaoh was beyond salvation and irrevocably committed to his own pride. Had he been permitted to release the Hebrews at an earlier stage, it would only have been a matter of expediency — something along the lines of, "these Hebrews are more trouble than they are worth." If Pharaoh had been capable of abandoning his panoply of animal-god idols and bowing to Yahweh, we must believe God would have permitted it, for at every point God welcomes the penitent sinner with open arms. As for the narrative, Pharaoh has now offered to let the men (and only the men) go worship, but his bargaining strategy backfires. Moses now demands specifically that every Hebrew person be allowed to go worship and, what's more, that they take their flocks with them. And we know that this retrograde bargaining will continue; instead of moving toward compromise, the demands of Yahweh and His people will only increase.